Do you have stamps you have never used? I do when I originally bought this fan stamp set from Wendy Walters I had so many creative images of what I would do with it, well time rolled by and I put the stamps away and have only just brought them out.I decided to make something that can be framed if the recipient wanted to do that. The fan is stamped out 7 times onto pale yellow parchment paper. I used Stazon white ink. Once stamped and the ink was dry I embossed from the back and did my perforating on the grid. Once all the blades were done I cut them out and put them all together with a glittery brad. 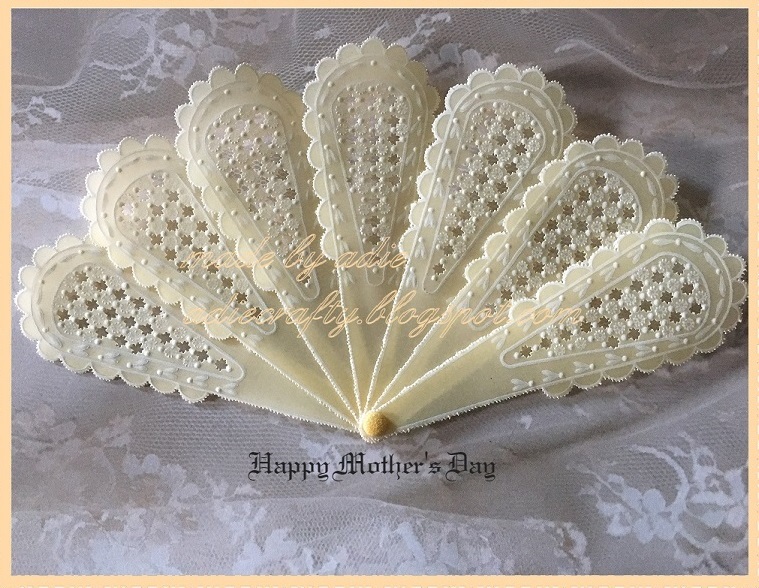 I layered the complete fan onto some lace patterned paper and attached it to a light yellow card.